We’d love your help. Let us know what’s wrong with this preview of Gabriel by Patricia Josephine. Alexander doesn’t want to help Uriel nor does he trust him, but the angel has promised him a better life. He swore to protect The end is in sight. To ask other readers questions about Gabriel, please sign up. The final book in the Path of Angels series. Gabriel feels his life fighting fallen angels has been forced upon him. Much anger simmers under the surface. He wants his own life, a happy and simple one. All Alexander wants is to be respected and to keep Charlie safe. It seemed Uriel could offer him everything he wants, until he meets Gabriel and his brothers. Alexander and Charlie are part of the key to helping the archangels in their mission, but will Gabriel keep to the path? This is the book I w The final book in the Path of Angels series. This is the book I was waiting for and it didn't disappoint. Gabriel is my favorite amongst the four brothers. His internal struggle with his path is intense and well-written. The plot is fast-paced and full of action. It brings us to the final big battle in Hell, and I really liked the way Alexander, Charlie, Zephyr, and Lake played into it. Everything tied together neatly. I couldn't help myself. I read it all in one sitting (and a half due to an interruption from a small child!). 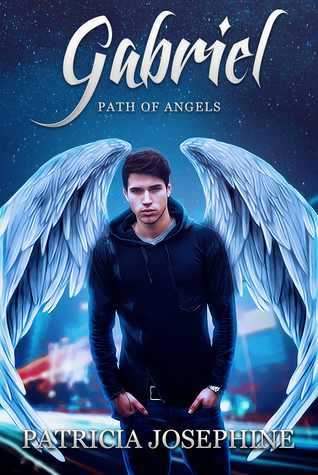 One thing I found interesting about Gabe (other than his anger) was the secrecy behind his di In this last installment of the Path of Angels series we have Gabriel's story. In the previous stories, Michael, Zadekiel, and Jophiel found love and fell from grace. The last brother left to fall, so they can battle Uriel and stop him from setting Lucifer free, is Gabriel. Gabriel's anger over being chosen, over his set path, and even in God is refreshing. But it is his anger that could be his downfall. This was an exciting ending to this series. Gabe was reluctant to begin this journey and carried his anger, fear and loneliness with him. I learned more about his character and source of his anger when he journeyed back to his hometown. How dreadful and heartbreaking that experience was for him. He desperately wants to just lead a normal life, love and be loved as his brothers have found mates. His rage at God for the path he must follow drives a wedge between him and his brothers. In order to stop Lucifer from being released on earth, he knew he must fall from God’s grace, but he is very reluctant to do so. His meeting of Alexander and Charlie (both nephilims) helped him to see and follow his God chosen path, albeit, reluctantly. An angry boy, two confused souls and a final battle. Gabriel finds himself strangely attracted to Alexander and Charlie, male and female half-breeds. Michael, Zade, Joe and Gabriel must descend to hell to counter Uriel's plan to free Lucifer. Gabe is an interesting character, different from the other brothers in that he carries a lot of anger in him at having his 'normal' life taken away from him. He uses his anger as a shield to protect himself from hurt. We have all acted like this at some time or another and it is easy to see where Gabe is coming from. Personally I quite liked Gabriel as the 'bad-boy' of the four angels (if you can have such a thing). Like the other book, this novel is fast passed, which makes for good reading, though I did fell that parts of the plot were a little too condensed. I would have liked more time devoted to the relationship between Gabriel, Alexander and Charlie (maybe one more chapter). The novel is still pleasing though, despite this quibble. What is interesting about this book, and in fact all four in the series, is the notion that perhaps imperfection is needed to defeat true evil. The tendency is to want to be perfect, and to make things perfect, but perhaps we are all most lovable in our very imperfection. I felt the most for Gabriel, the reluctant one of the brothers who wanted nothing more than to live a human life. His being denied the one thing he yearns for most is poignant. I liked the twists in this final story of the series and how Gabriel interacts with Alexander and Charlie. Charlie is mute, so this was a challenge for the writer to reveal who she was. I think Ms. Josephine did a credible job with physical description and captured this silent character very well. Of course, you must root I felt the most for Gabriel, the reluctant one of the brothers who wanted nothing more than to live a human life. His being denied the one thing he yearns for most is poignant. I liked the twists in this final story of the series and how Gabriel interacts with Alexander and Charlie. Charlie is mute, so this was a challenge for the writer to reveal who she was. I think Ms. Josephine did a credible job with physical description and captured this silent character very well. Of course, you must root for these characters who are sacrificing themselves to save the world from Lucifer, so as much as you would wish they could side-step their fall into hell, you know it's inevitable. . .or you believe it is as you read the story. I won't tell you if it is.